Paris. One of the most beautiful cities in the world, with glamour, style, and sophistication deeply rooted into its culture. Where better then to house Designing 007: Fifty Years of Bond Style, the phenomenal exhibition exploring the world of James Bond through the props, costumes, models, production artwork, and vehicles that have spanned the film franchise over the last half-century? The exhibition itself opened with typical Bondian flair, with the red carpet approach to Paris' Grande Halle De La Villette flanked by a collection of some of the most beautiful Aston Martins to ever be collected together in one place, including an Aston Martin DBS from 1969 (as driven by George Lazenby in "ONMSS"), a DB2/4 Mk III (the car Fleming gave Bond to drive in "Goldfinger"), a concours standard DB5 that looked as though it had just rolled out of Q's workroom and, the pièce de résistance, the incredibly rare Aston Martin DB10 from "SPECTRE". Through the doors and into the exhibition space, there is yet another DB10 (this one to be a permanent addition to the exhibit) as well as another stunning DB5, complete with a diorama of the Alpine road from "Goldfinger". To have two DB5s and two DB10s together in one place is something of a rare occurrence to say the least. 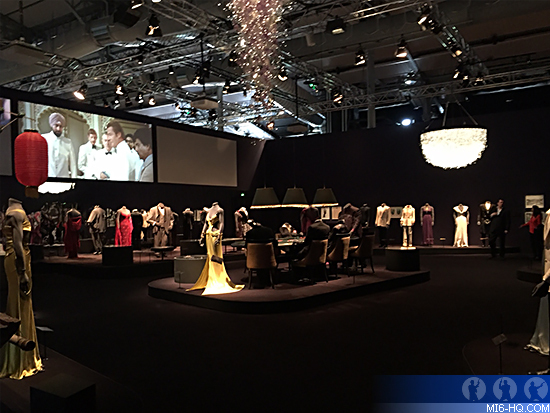 Inside the venue, guests mingled as the Bollinger (currently Bond's favourite bubbles) flowed, whilst glamorous models, who each looked every bit the Bond girl, posed for photographs with the guests and the vehicles. Upstairs, the Belvedere vodka bar served up Vespers, shaken or stirred, whilst guests indulged in a little light gambling on the roulette and blackjack tables. With the chips having no monetary value, much like Bond, you had nothing to lose. 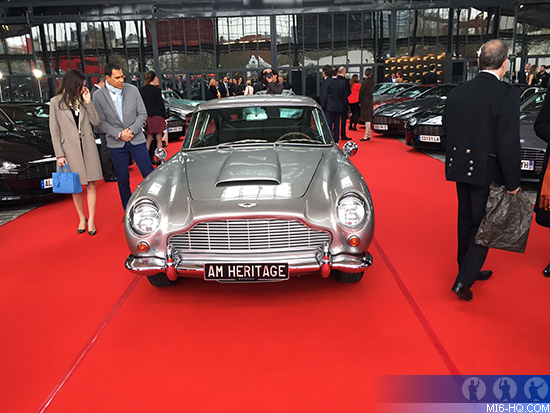 The event was organised by Laurent Perriot, who ensured there were plenty of Bond alumni amongst the guests, their presence lending a particularly Bondian feel to the proceedings. Amongst the special guests were former Bond Girl Maryam d'Abo, as well as legendary stunt coordinator Rémy Julienne, who worked on six Bond films, and also the co-founder of Parkour and occasional Bond villain, the extremely affable Sébastien Foucan. Also on hand were the EON Archivist Meg Simmonds and Bond costume designer Jany Temime, who designed both "Skyfall" and "SPECTRE", who has undoubtedly redefined the look of the cinematic James Bond over the last five years. 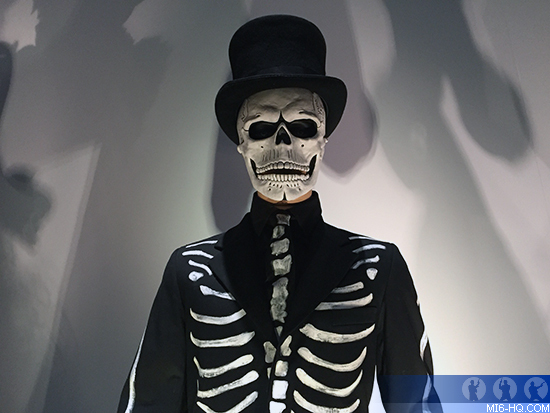 Temime's costumes, including Bérénice Marlohe's crystal-studded backless gown from "Skyfall", Monica Bellucci's handmade corset from "SPECTRE", as well as a host of Day of the Dead costumes from "SPECTRE", have all been added since the exhibition opened in London back in 2012 and are now a permanent fixture in the exhibition. Meg Simmonds was gracious enough to provide us with insight into the new additions to the exhibition since the release of "SPECTRE", which includes Bond's ivory dinner jacket, Q's smart blood device, Moneypenny's security pass, Bond's initialled cuff links, Madeleine Swann's Chloe handbag, Bond's Globe-Trotter luggage, Hinx's deadly steel thumbnails, and much more. One of the great things about "Designing 007: Fifty Years of Bond Style" is that it is organic and changing. With every new Bond film released and every new city that plays host to it, it grows in size and adapts to the context it finds itself in. Whether it is in London, Moscow, Mexico City, or Madrid, Designing 007 finds something from its host's city to make it unique. For Paris, the Bond connection is twofold: Not only was featured in previous Bond films "Thunderball" and "A View To A Kill", as well as being where the majority of "Moonraker" was filmed, it is also one of the few cities in the world whose effortless style and sophistication equal Bond's own.